← Happy Birthday Au Bon Marche! 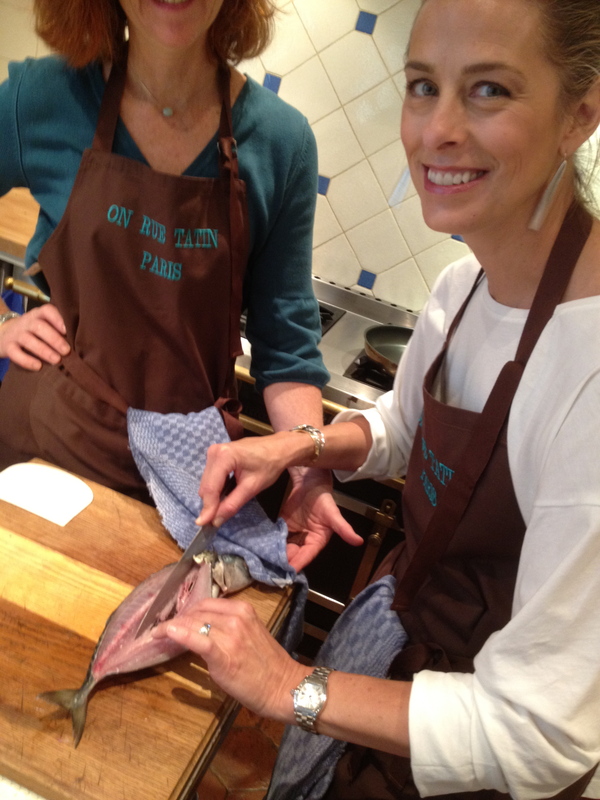 I’m sure you recall Guest Blogger Susan Loomis, who wrote here about her fabulous cooking school in Paris and in Normandy (“On Rue Tatin”) , and who actually convinced me to attempt to fillet a fish. Now it is my turn to describe the very fun day that my (other) friend Susan and I spent with (Chef) Susan in October. 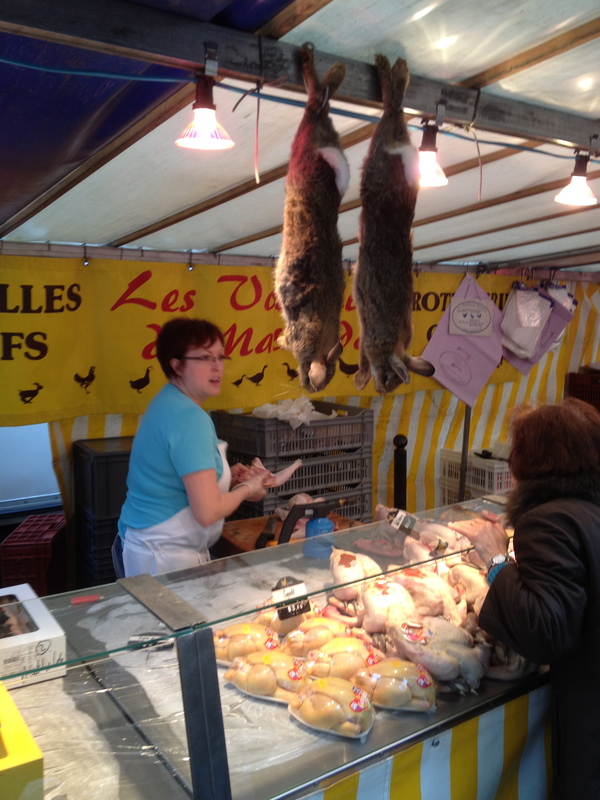 We met Susan at the Raspail Market in St. Germain, which is a gorgeous market that I do not visit often enough. Susan picked up ingredients for our lunch, and also shared some of her wisdom about shopping at the market. Some of those tips apply to shopping in the States, as well. For example, she told us that we should always request that our fish be accompanied by some ice in its bag, and to then put it in the coldest part of the fridge and keep replacing the ice as necessary. Obviously you don’t want to store the fish very long, but during that time it should stay as cold as possible without freezing. When you buy squid it should look like this! I’m not sure what this woman is holding in her hand, but they do cut off the heads of the chickens for you if you want them to. Um, yes please. Something that neither Friend Susan nor I knew was that all produce from Holland is grown hydroponically, which results in beautiful produce with no flavor. Because sellers are required to indicate the country of origin of everything they sell, it is easy to avoid Holland’s tasteless veggies. 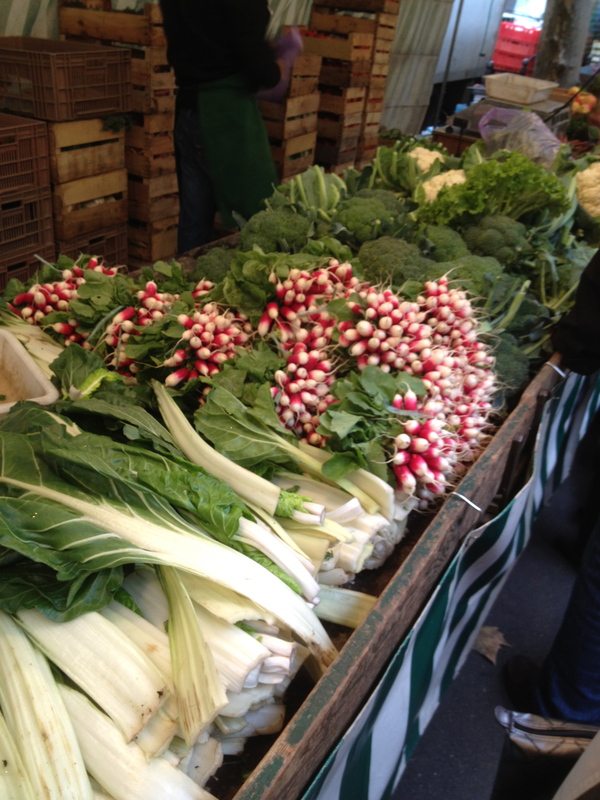 These lovelies were locally grown and had the dirt and the aroma to prove it. When Chef Susan learned that neither of us were experienced with scallops, she picked up three. They were just coming into season and she thought these looked particularly good. 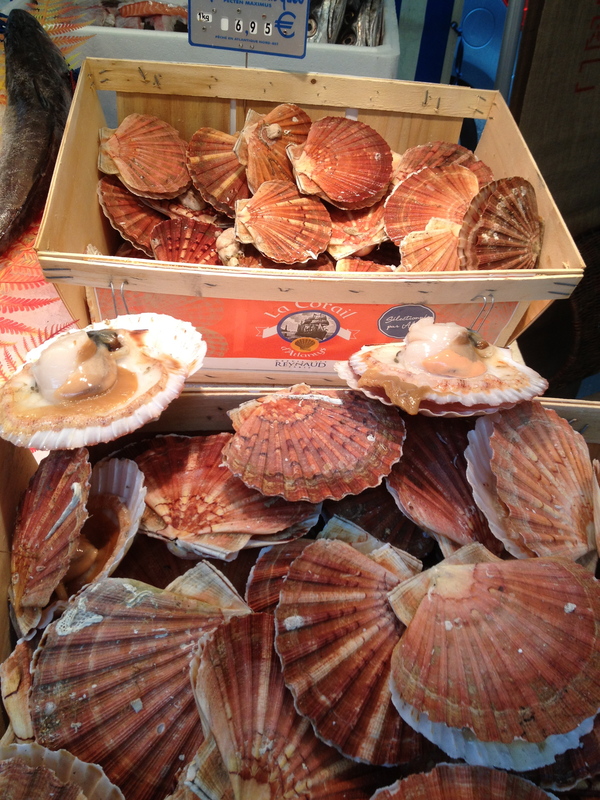 We learned that if you buy them still in the shell, like these, you have to carefully pry them open like a mussel. Then you cut the “skirt” off, which is the drapey piece that hangs off the round part we all recognize as scallop. These were still alive when we prepared them in the kitchen! Chef Susan convinced me to try a thin slice of raw scallop, and it was surprisingly sweet, mild, and delicious. As Susan mentioned in her post, we bought three whole mackerel at the market, which is something I had never done before. 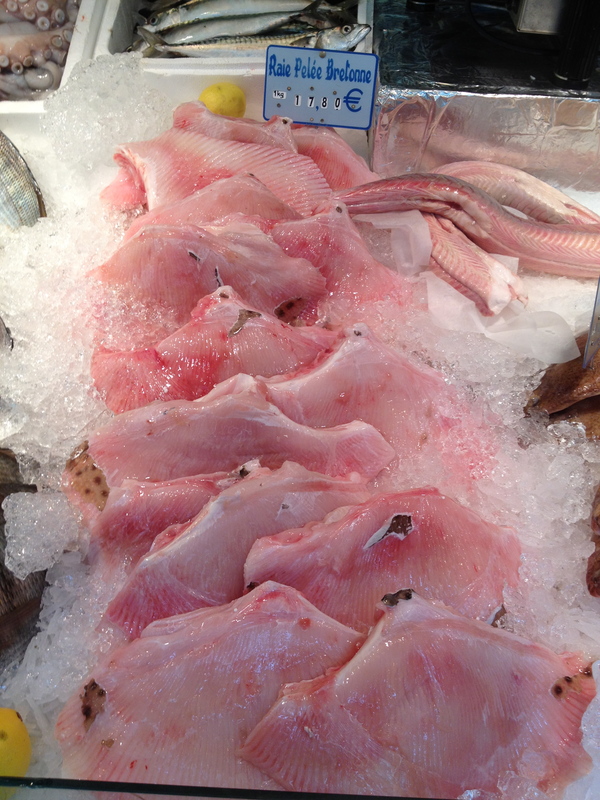 The fish monger cleaned them, but Susan still had to rinse them well to remove the (ick) blood. 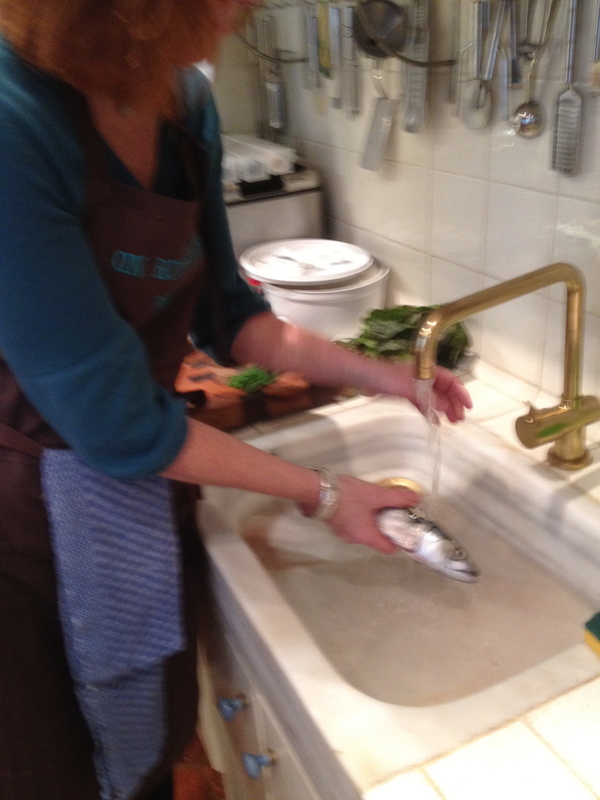 Here is my friend Susan trying out her hand at filleting a clean mackerel. Well done, Susan! Now will you do mine? 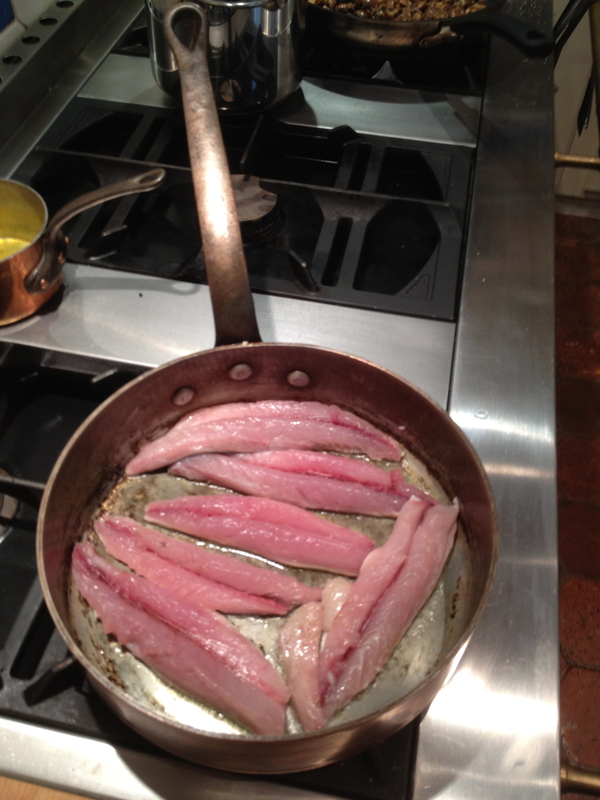 They were then sautéed gently in some olive oil and seasonings. So easy! And so delicious. 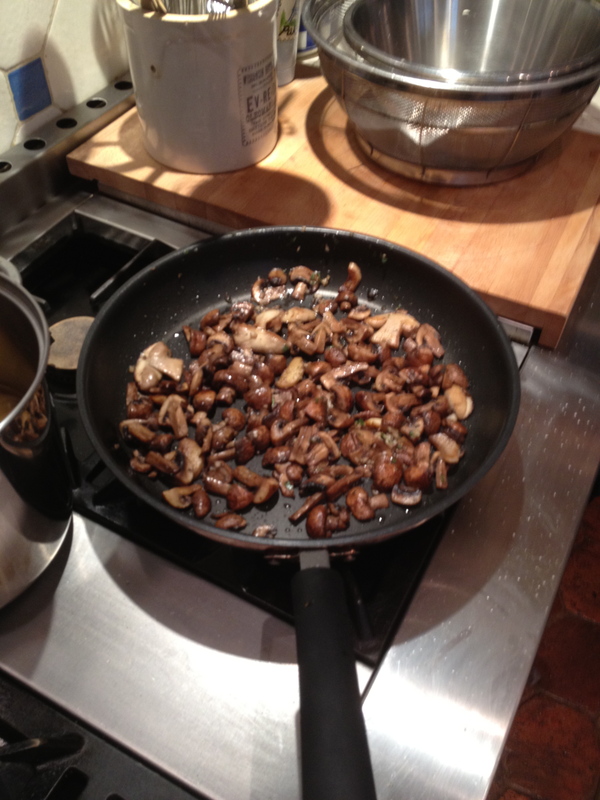 We also sautéed mushrooms, which were just coming into season, with garlic and sage. Susan showed us how to add a touch of mustard to some of that amazing creme fraiche (sold to her by the woman whose cows made it days earlier) and whisk it into a lovely dip for raw vegetables or even bread. Actually, I can’t think of anything that wouldn’t be good dipped into that stuff. 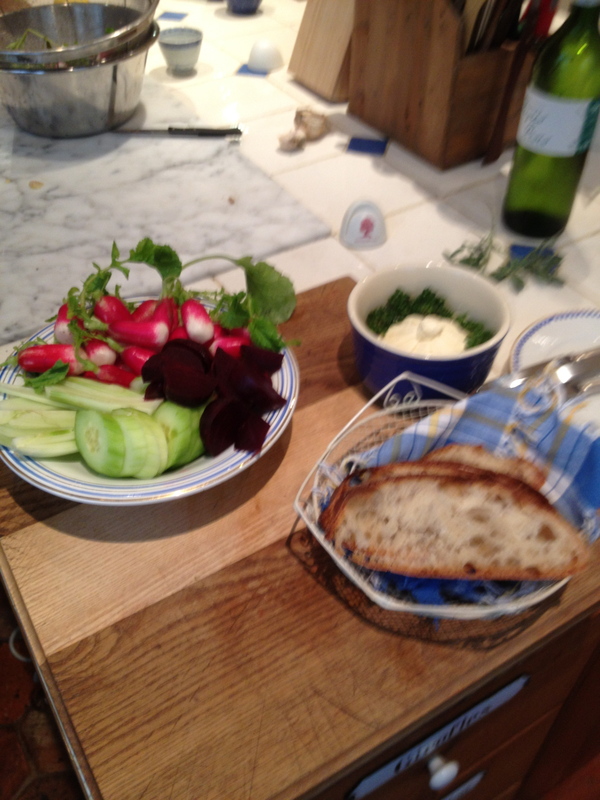 We also made a green salad with a wonderful classic vinaigrette, ate some amazing cheeses, and then had poached pears that were sublime. 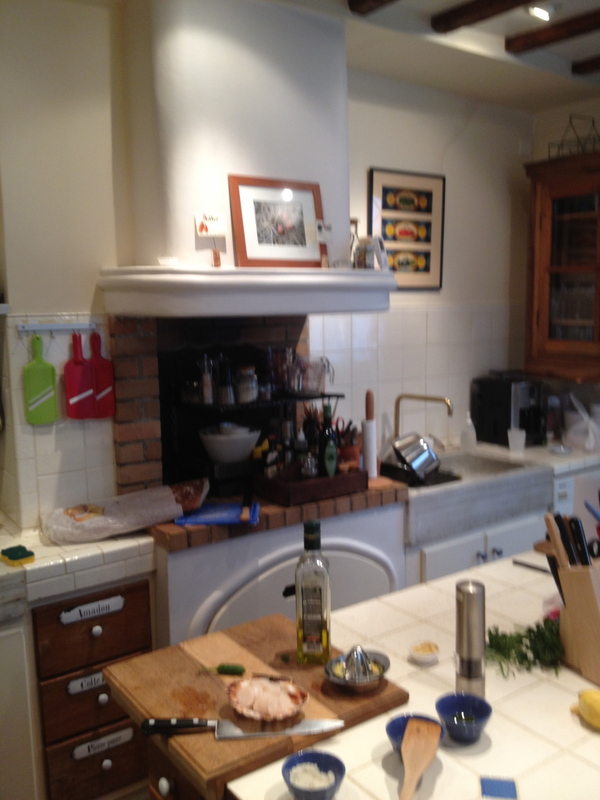 The kitchen where Susan teaches actually belongs to Patricia Wells, a well-known (American) cookbook author and cooking school teacher who divides her time between Paris and Provence. You may have seen her as a guest on Barefoot Contessa. 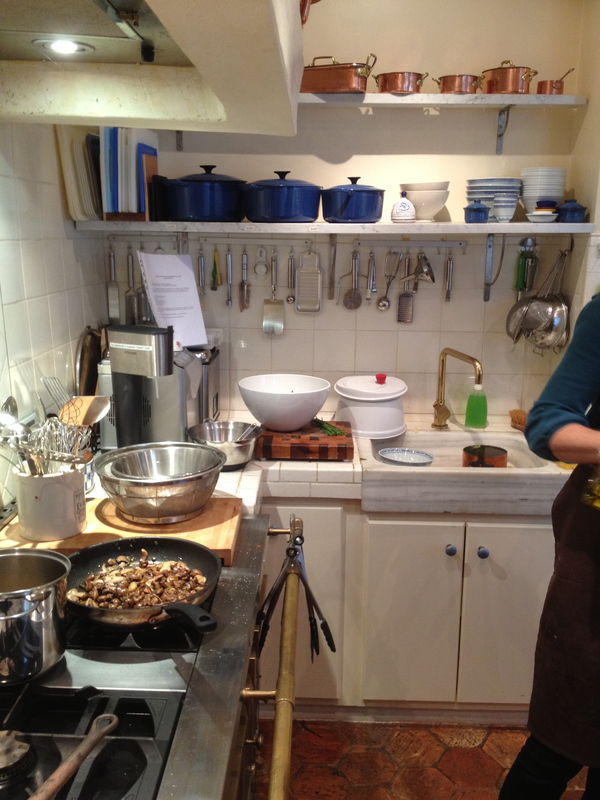 Her Paris cooking studio was gorgeous, and Susan and I could hardly keep our eyes on the cooking we were so distracted by the perfection of the surroundings. The kitchen was small, but had everything. I loved the two stone sinks, both of which were shallow prep sinks. Also, the copper cookware was beautiful. 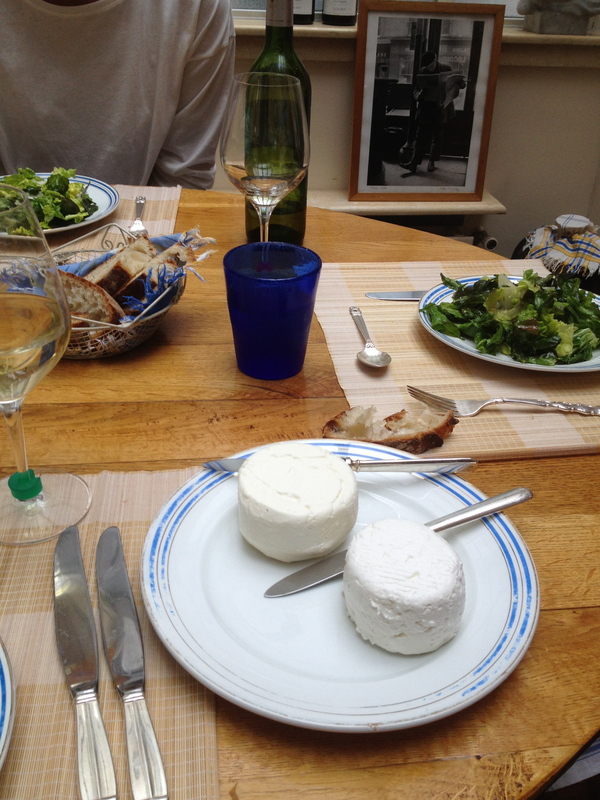 The three of us sat down together and enjoyed the fruits of our labor with some delicious wine (bien sur). 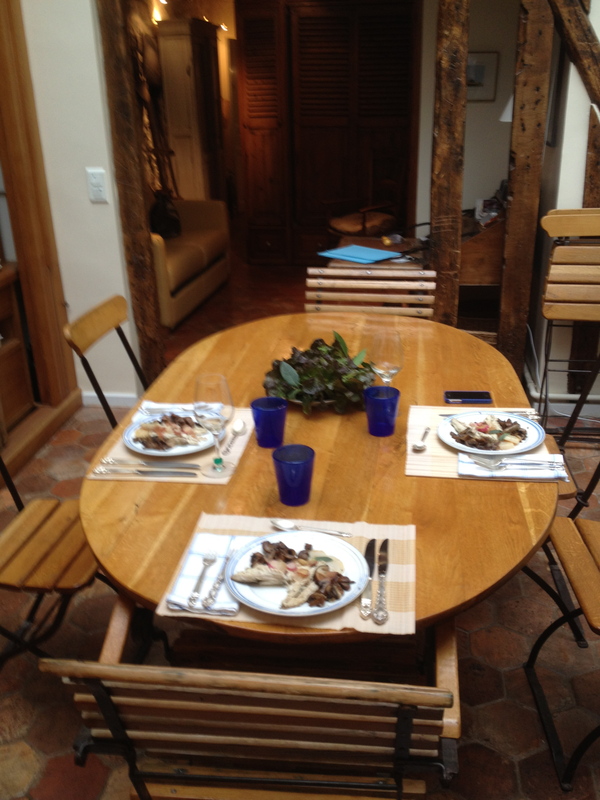 While we ate, Susan and I peppered Susan with questions about her life and how it led her to France. In the course of our conversation she casually mentioned her friend Adam Gopnik (see my Books page for how I feel about Adam!) and called David Lebovitz her Jewish brother. She was very gracious, and when we left, Susan and I felt like we had just spent a lovely day with an old friend. Well, an old friend who could cook really, really well. In addition to being super nice, Susan taught us a lot about a lot of different things. Like her trick of using an upside-down spoon to peel ginger. And which salts to use when, and which salts to use never. And how to clean veggies. And how to clean my new copper pot. If any of you want to take one of Susan’s classes while you are visiting me, I’ll be delighted to spend another four hours in Patricia Wells’ kitchen with you and Susan Loomis. Just tell my husband you can’t possibly do it alone. I’m sure he’ll understand. 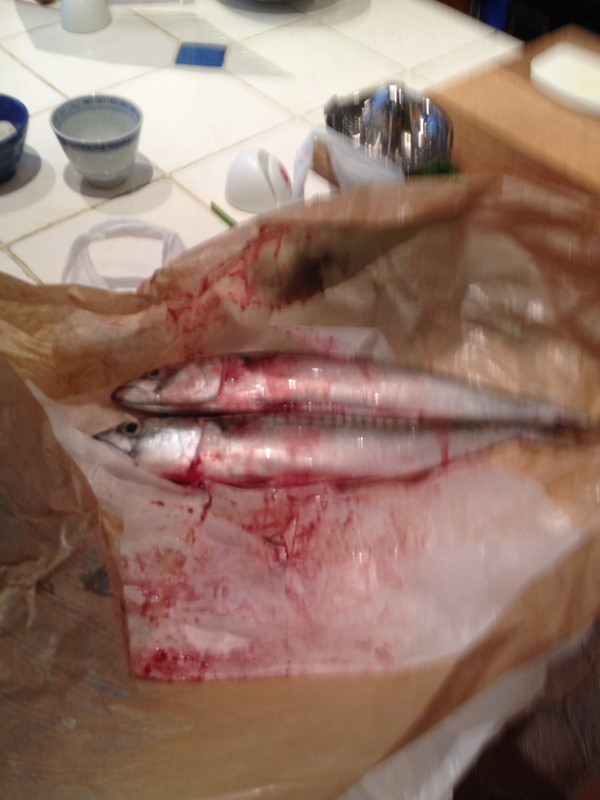 Maybe I”ll do mackerel for Thanksgiving. Will you give us a lesson when you come back for Christmas? What an amazing day! I want to be you … But you already know that, n’est-ce pas?